Can You Eat Raw Quinoa Grain? Whether you're coping with a cold or just trying to warm up, there are times when nothing hits the spot like a hot drink. Though coffee, hot chocolate and hot cider make frequent appearances on hot beverage menus, drinks made with fresh ginger may be a healthier choice. Because ginger can have a strong effect on some people, you should check with your health care provider about potential risks if you plan to drink hot ginger beverages on a regular basis. Ginger root is the underground part of a plant known as Zingiber officinale. 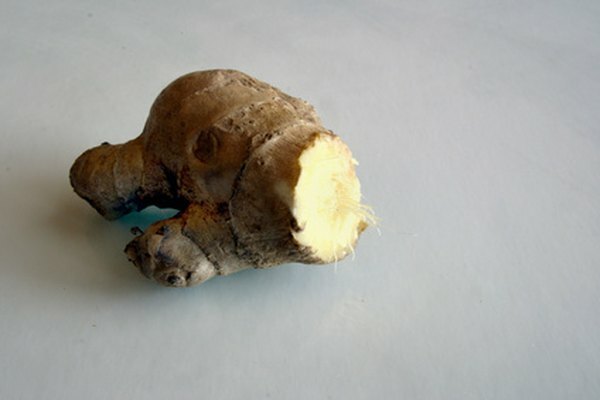 Most commonly, ginger root is a knotty, knobby, beige-colored stem that hides a sharp, spicy, yellowish interior. Ginger root is typically peeled, then shredded or chopped and added to hot liquid to make ginger drinks. Hot drinks made from fresh ginger are often tasty, but they may be good for your health too. According to the University of Maryland Medical Center, ginger can soothe motion sickness, morning sickness and other types of nausea. Ginger can also soothe inflammation, which may make hot ginger drinks a good choice if you have a sore throat. Ginger may also have cardiovascular and anti-cancer benefits, but more research in those areas is needed. You can make a basic hot ginger drink by shredding 2 tablespoons of ginger root and steeping it in hot water for about 20 minutes, suggests the University of Maryland Medical Center. The Kitchn, a cooking information site maintained by the Apartment Therapy lifestyle network, suggests squeezing the juice of one generously sized lemon wedge into your hot ginger drink. You might also try a squirt of honey to add a bit of natural sweetness to the beverage. If you're shopping for fresh ginger to make your hot beverage, keep these tips from The Herb Companion magazine in mind. Squeeze ginger roots and opt for roots that are firm to the touch. Bypass soft or moldy ginger roots. Extend the life of your ginger by wrapping it loosely in plastic and storing it in the refrigerator. The Herb Companion recommends throwing out ginger root after two months and replacing it with fresh root so that you maximize the potency of the ginger's essential oil. The amount of ginger you get from a hot beverage is usually safe, but if you drink large quantities of ginger, you may experience mouth irritation, heartburn and diarrhea, according to the University of Maryland Medical Center. If you have a bleeding disorder or take blood thinning medication—including aspirin—you shouldn't drink fresh ginger. People who have gallstones should consult their health care providers about the potential risks of fresh ginger. You should also ask your doctor before using fresh ginger if you're pregnant.